A quick glance at the assortment of Atari games, accessories and the console itself in the picture here draws a resounding "meh" from me. It's not because of a lack of interest in any way. In fact those who know me well understand I have a large assortment of Atari systems, ones that are hooked up to televisions around my rec room, even obscure and poor selling ones like the ill-fated Atari Jaguar. The "meh" is because nothing in the photo is anything I haven't seen before many times. In fact even the Xonox cartridge, what some of us in the collecting hobby call a "double ender" since both sides are a working game, isn't uncommon in a bin full of Atari games at a thrift store, pawn shop, flea market or retro gaming convention. 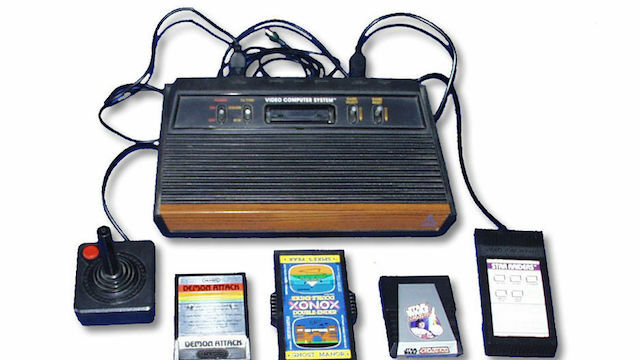 The Atari console itself isn't even much to write home about - it's a four switch later revision and not the coveted "heavy sixer" that got its name for both its extra weight and the six control switches across the top. Looking at everything pictured here what would you guess is a reasonable price to pay if you were buying it from a thrift or a garage sale? Tested and working I'd say it's $20 at the low end, $50 at the top end, and anything in between is a haggle. The value is mostly in the tested and working console though and controllers. A seller might get $5 apiece for each of the games individually if you're lucky, but a buyer might find them in a box of "tapes" at a Goodwill and pay a buck each. Apparently if you watch the "reality" TV show Storage Wars though, and I use the word "reality" very loosely though, this same pile of goods might be worth $300 or MORE. Pat the NES Punk has already ranted about this several times on the #CUPodcast - here's a little taste. To give you a Cliff Notes version of their problems with the show (and mine too), they set exaggerated base values for common loose games, which is already a negative to the collectors out there who want boxed complete games (with manual and instructions) and therefore lower in value. You'll note everything I pictured above was in such condition - no manuals nor boxes. They'll arbitrarily decided that a loose 2600 game which I know from experience is a $1 game (and has been consistently for almost 18 years) at $5, then extrapolate that an entire box with say 100 of those cartridges inside is worth $500. That's just insane. Even if you got to the high end of rare Atari games, what collectors consider "R8" and up, there's still an incredible range of fluctuation. If you had one R8 in that box out of 100, you might have $200 in games total - not $500. The prices they quote on vintage games though are not in touch with reality, even today when retro nostalgia is at an all time high among collectors. When fake reality TV shows get into the act though SPECULATORS come pouring in. As Razorfist (complete with his Bret Hart mirror shades) explains so well, this happened once before with comic books in the 1990's. Fueled by the hype in the mainstream media, everyone suddenly believed their pile (or parent's pile) of old comic books was suddenly more valuable than actual silver or gold. They of course missed the point much as baseball card collectors had before them and so on - what was "valuable" was not the medium of the media itself. For a collectible to attain value it must be genuinely rare for any number of reasons. Something that hundreds of thousands of copies were printed of CAN be rare if it's (1.) old enough and (2.) nobody handled it with care because it was just "a comic book" then (3.) everybody eventually threw them away. Combine all of that with (4.) an established character's first appearance in print, like Batman or Superman, and you do indeed have a gold mine, but like prospecting for real gold you're just not going to stumble on it. Most of the easy to find gold was dug up long ago, and that pile of comic books you have is surprise surprise worth nothing. Even if you were one of those speculators who bought "short print run" comics or "collector's edition cover art variants" you're out of luck, because once they became collectible, everybody bought them and everybody put them in sealed bags and there are thousands or more for sale on eBay and in every comic book shop around the country every day. That's not "rare" at all. Many speculators got exactly what they deserved for believing the hype, but so unfortunately did a lot of uninformed people who got sucked into thinking modern day comic books would ever be as valuable as the ones their grandparents read and threw in the trash. So yes there is value in old video games that were treated the same way, to a point, but not every old video games is the same in the way that not every old comic book is the same. Action Comics #1 and a complete in box NES Stadium Events both have value. That pile of Hellboy comics from the 1990's and a random copy of Super Mario/Duck Hunt does not. Shows like Storage Wars are misleading everybody with a dusty box full of old games from grandmas to flea markets to eBay sellers into thinking their s--t don't stink and it's actually solid encrusted gold poop. It's still s--t though and these shows aren't serving any master but ratings. People don't take kindly to their pile of Combat, Asteroids, Space Invaders and Defender carts being called worthless, but not everything that glitters is gold. And like Razorfist says, don't buy games for investment, play them. Don't take these jokers on Storage Wars at face value when they price a box full of crap at hundreds of dollars without actually going through it piece by piece, and don't assume that the highest price anything ever sold for on eBay just one time is the actual literal value of something now and forever. It's not. The actual value is what somebody's willing to pay a seller, and you may just find that box of Atari games you bought isn't worth what you think it is.